For 'conventional' applications where pricing is important , Cat Cams offers a vast range of high quality chilled cast iron camshafts. Typical applications are fast road and moderate competition camshafts. Development of a casting requires high production volumes, so these are only available for a limited number of big volume applications. When castings are not (yet) available, the steel billet production line at Cat Cams brings the answer: the development cycle for the BMW Mini R56 Turbo engine was about 6 weeks from arrival of the sample parts. 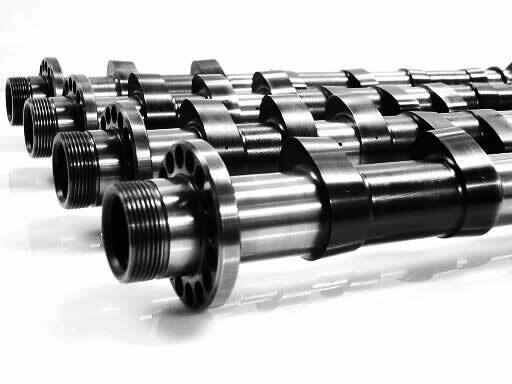 The work included design and manufacturing of steel billet camshafts (see picture below), cam profile design and development of a dual valve spring kit. For more demanding applications such as dedicated competition projects, the steel billet production line gets in action as well. Beside casting availability, there are some other reasons to prefer steel billet camshafts: gun drilling a 20mm hole over a length of 400mm saves about 1kg. Thanks to this reduction, the weight of Cat Cams steel billets rivals assembled hollow lightweight camshafts. However, the advantage of these 'single piece' steel billets is an important improvement in stiffness and strength, allowing higher acceleration cam profiles.